The FIFA World Cup is an event that breeds video-technology innovation. For the 2018 edition, FIFA TV is showcasing the first-ever major sports event produced in UHD HDR, with advances in streaming and even next steps in virtual reality. No innovation, however, is having a more profound effect on this tournament than the debut of Video Assistant Referee, or VAR. It has been the talk of the tournament so far, and reviews from across the soccer world have been overwhelmingly positive, especially as the tournament has progressed. The system has been largely effective and helped bring clarity to many plays, especially those in the box that lead to penalty kicks, that may have bogged down previous tournaments. FIFA’s Sebastian Runge has played a key role overseeing implementation of VAR at this year’s FIFA World Cup in Russia. VAR, which FIFA began testing more than a year ago at the FIFA Club World Cup 2016 in Japan, has grown by leaps and bounds and has even had the benefit of learning from similar implementations by domestic leagues in Germany (Bundesliga), Italy (Serie A), and the U.S. (Major League Soccer). There are two VAR control rooms at the International Broadcast Center (IBC) in Moscow, with two full VAR stations in each. Each station has numerous monitors, including the live match feed, various isolated feeds, and playback. A VAR team comprises the lead VAR and three assistants: AVAR1, AVAR2, and AVAR3. All are licensed FIFA match officials. The lead VAR’s job is to watch the main-game-camera feed and, on a quad-split touchscreen monitor that he controls, review incidents when action calls for it. 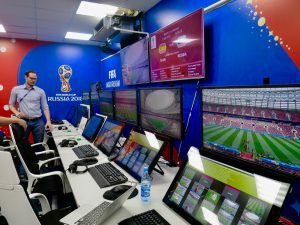 The lead VAR is the only member of the team in the control room who can recommend that the lead official make an official review, but it’s ultimately the on-field officials’ call whether to head to the sidelines to use a monitor stationed at each venue. As for the AVARs, AVAR1’s job is to also monitor the main game feed, particularly when the VAR needs to look away from live action to review a replay. AVAR2 is positioned at a station dedicated to covering offsides (a new feature described in more depth below). AVAR3 watches the live match feed of the Host Broadcast Services (HBS) production while also providing support on communications between the VAR and the on-field official. What Video Feeds Does the VAR Have Access To? All 12 stadiums across Russia are connected via fiber to the IBC and the VAR control room. Inside the control room, the VAR team has access to all the individual camera feeds generated by HBS to produce the live match. That includes eight super-slow-motion feeds, four of which are ultra-slow-motion. There are also two locked-off cameras to monitor offsides (more on that a little later). The camera complement expanded as the tournament moved into the Knockout Stage. An ultra-slow-motion pole camera has been added behind each net. The various slow-motion cameras are, naturally, very helpful in certain VAR-worthy situations, such as establishing point of contact between players on a possible foul. The only feeds that the VAR control room does not receive are those deemed unnecessary, such as the aerial camera from the overhead helicopter, the beauty-shot camera, and any interview cameras onsite. One of the biggest additions made to the system prior to this World Cup was the introduction of an Offsides Station in the VAR control room. Two VAR control rooms, each featuring two VAR setups, are located at the IBC in Moscow and connected via fiber to all 12 venues across the country. Two additional static cameras have been installed at all 12 stadiums, positioned between the top of the 18-yard box and midfield to give what are intended to be clear views of any offsides call. 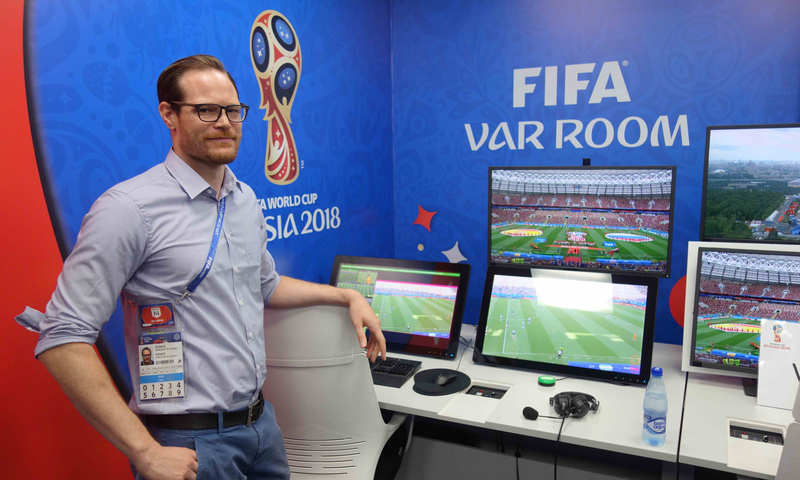 The raw feeds of these cameras are exclusive to VAR (HBS does not have direct access to them and can broadcast only replays provided by the VAR room), and a member of the VAR team is dedicated solely to reviewing offsides video. The offsides-monitoring solution is integrated with goal-line technology. A computer-generated offsides line is created and can be used to help the VAR and the on-field official make a judgment on offsides. A major obstacle in the early days of VAR was communications between the on-field official and the VAR control room. According to Runge, it was, perhaps, the greatest challenge faced when the system was used for the FIFA U-20 World Cup Korea Republic in 2017. Following that tournament and FIFA Confederations Cup 2017 soon after, FIFA knew it needed to fine-tune comms prior to the big event here. It was also at that moment that the decision was made to split audio and video. Having full confidence in the video workflows, FIFA saw significant value in working with a company whose true expertise was in audio technology. Unlike the NFL and the NHL, FIFA does not require the on-field official to make an official verbal explanation of the upholding or changing of a call on the field. The change is simply executed. Making an announcement was considered but was ultimately determined not a good fit currently. Instead, a staff member in the VAR room, using a tablet interface, informs broadcasters and viewers accessing FIFA’s various digital platforms of the review and its outcome. The staff member can select from an in-depth graphics template that features all the possibly reviewable outcomes. When all the proper items are selected, the information about the call automatically generates messages to the onsite and offsite commentators, along with graphics for use on television, the in-stadium videoboard, and FIFA.com.